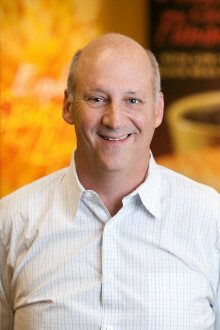 Ron Shaich is the Founder and Executive Chairman of the Board of Panera Bread Company, where he previously served for over 20 years as the company’s Chief Executive Officer. Today, Shaich is directing a range of long term innovation and strategic initiatives for the company. Shaich began his career in the bakery-cafe industry in 1981 and went on to co-found Au Bon Pain Co., Inc. and, ultimately, founded Panera Bread. Today, the Company operates or franchises over 1,540 locations in 40 states and Canada. System-wide sales in 2010 exceeded $3 billion. Under Shaich’s leadership, Panera was the singularly best performing restaurant stock when measured over his last decade as CEO and the second best performing consumer stock on the S&P consumer index when measured over that same decade. Panera is the 6th most valuable publically traded U.S. restaurant company (as of March 29, 2011). In his many years as CEO, Shaich received widespread recognition for his leadership. Shaich was awarded the 2011 MUFSO Pioneer Award for being one of the most significant contributors in the history of the food service industry. Past winners have included Colonel Harland Sanders, Ray Kroc, Norman Brinker and J. Willard Marriott, Sr. In 2005, he was awarded IFMA’s Gold Plate Award for being the outstanding leader in the food service industry. As well, he has twice received the Nation’s Restaurant News Golden Chain Award which is given to figures who exemplify success and leadership in the food service industry. Shaich also serves as President of the Panera Bread Foundation and recently spearheaded the Panera Cares initiative, through which the Foundation created nonprofit community cafes aimed at addressing issues related to food insecurity. He is a member of the Board of Directors of the Lown Cardiovascular Research Foundation and on the Board of the Rashi School. Shaich formerly served as Chairman of the Board of Trustees of Clark University. Do you want to hire Ronald M. Shaich? Directly request a quote. In 48 hours we can send you the availability of Ronald M. Shaich If you would like to book Ronald M. Shaich, Entertainment Booking Agency is the right place. We will offer you the best price and contact the management or we directly contact Ronald M. Shaich. For corporate appearances or speaking engagements you can contact our agents and the will help you true the process. Tags: hire Ronald M. Shaich, Ronald M. Shaich booking, book Ronald M. Shaich, Ronald M. Shaich appearances, find more information on booking Ronald M. Shaich for appearances, Ronald M. Shaich speaking engagements, Ronald M. Shaich endorsements/spokesperson, Ronald M. Shaich appearance fees, Ronald M. Shaich booking agency contact info, biography of Ronald M. Shaich, Contact an artist booking talent agent find a speakers bureau that can book Ronald M. Shaich, speaker booking agency for Ronald M. Shaich, Ronald M. Shaich booking agency, Ronald M. Shaich booking for corporate event. EBA is one of the biggest entertainment booking agencies in the World. We book hundreds of celebrities, artist, athletes and speakers in a year. Important to know is that we are not claiming to be the management of Ronald M. Shaich. We are not the official agent for Ronald M. Shaich. Companies from around the globe book these artists and speakers true our company be course we have one of the biggest networks and we always have direct contact with the artist or the management. We help you to find the right celebrities for your corporate of private events. Please contact one of our agents to get free advice and we will help to get the world-famous artist on your party.